What an amazing prize! I’m entering. i’m a huge fan of your work, and would treasure a portrait!! I would love a portrait from your talented brain and fingers. I just hope I look more like Tesla and less like the Log Lady. pick me! i’d love a portrait from you! Please enter me! Your portraits are beautiful! So entering, I love your portraits! What an incredibly generous give-away! I love your work and would be thrilled to receive an embroidered portrait. Thanks! Holy cow, this would be so amazing to win. I already have a spot picked out on my wall for it! I would LOVE to win! You have such mad stitchin’ skillz! That gum you like is going to come back in style, which is why I’m entering. Holy moly, what a tremendous giveaway! Count me in for sure. team, i’d be honored to come out looking like the log lady. I am a big fan of your stitching! 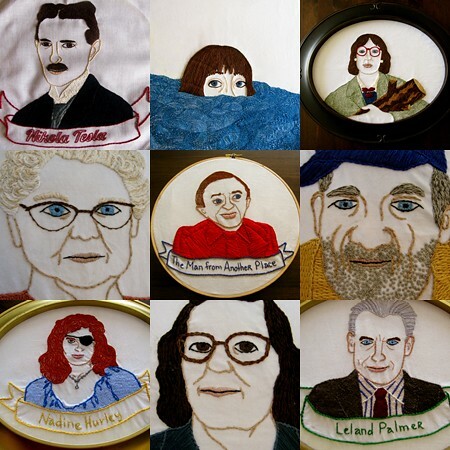 I would be THRILLED to have my portrait embroidered by you. Crossing my stitchy fingers! Fabulous! This is absolutely the most crafty thing I’ve seen lately. Saaaweeeet! P.S. Loves ya on facebook too! Great giveaway! Very generous of you! Wow! What an incredible prize. And I love the Twin Peaks portraits! I’ve always wanted to be a cool kid!!! And I’ve been stitching in one form or another since I WAS a kid (a long long time ago), so what better way to have my portrait done than in stitches!! Thanks so much for offering this giveaway! You’re one of the cool kids now! I would LOVE to win hand embroidered work by you!! Thank you so much for this giveaway!! Wow! I’d love to win. What a great idea! I’ve looked at your work before and its so unique and clever! Thanks for the give away! This would be awesome!! Your work is amazing! Thanks for the opportunity! Wow! I wonder how I would look like in embroidery?! Love your work, it would be so great to have a personal portrait made. I would love to enter. It would make a fantastic gift for my girlfriend. I hope you have some bright embroidery thread, she has pink hair! I love your portraits…it would be an honor to win one! Gee, I hope I am lucky!! Love this! Thanks for the opportunity! This is the coolest thing ever! I want one!!!! Thanks for being so generous! I’d love to win an embroidered portrait! Thanks for a chance to win. This is so cool! I’d love a portrait! You’re so talented! I would love for you to do me your portraits are just lovely so please pick me. OMG OMG OMG! You almost got me pee my pants in excitement! It’s too good to be given free!!!! Your portrait is extraordinarily gorgeous and detail! Hard work I know!! I think I’m going to make one of my late Welsh Corgi, I think I have enough pics of her from the ummm…shoulders up. But I’d love seeing her in a dress, just like humans do. My true beauty comes out in a satin stitch. oh my goodness, what an amazing giveaway! consider me entered, please! What a cool giveaway!! Whoever wins this will be a lucky duck for sure! I would love to enter! Those hoops are pretty rad. Great idea! Whoever wins is lucky, hope it’s me. If not, maybe I’ll take a stab at it? Who knows? Stranger things have happened. wow! I’ve just found your blog. Amazing work. Fingers crossed. New to your site, but: YES, PLEASE! Hell, yes! I want to be portrayed by you! I would love love love this sooo much! Incredibly cool! This would be a wonderful gift for my daughter’s upcoming birthday. I have a picture of her ready to send when I win! thank you for having this giveaway! i’m soooo excited!!! Maybe it’ll be me who has an awesome portrait made! Awesome work. OMG your work is amazing. Of course, please, yes, put my name in. Thank you for the chance to win. Win a portrait from you? Gadzooks, I’m in! Fabulous gift-away; thank you for the opportunity and please, count me. Your portraits are awesome! I would love to win! This is such an amazing giveaway! I would be honored to win! Your stitching is absolutely breathtaking! It would be an honor to win this giveaway. The portrait I would choose would be of a mentor of mine who passed away earlier this year. GAW, that would be just amazing! Your work is a personal inspiration to me in my little attempts at stitched self portraiture. Lovely contest. I tweeted about it and liked it on FB. The winner will be lucky indeed. All the best! What lovely work. Really inspiring. This would be so amazing! What a great contest and a chance to win something so amazing. What inspiring work! Wonderful! These are amazing. I’m entering. Love your work! Please enter me in the contest. Woohoo! Pick me, pick me! I love your work, especially the Twin Peaks portraits! I would love an embroidered portrait! One day my log will have something to say!! Fantastic!! wow! your work is beautiful. i came over via feeling stitchy and have to say this is an amazing giveaway! Oh my gosh, what a perfect gift this would be for my amazing new husband. He runs a design retailer and would be CRAZY about it! Your work is AMAZING. I love the Log Lady portrait. LOVE IT! These are simply amazing! I love the Tesla! oh, the log lady! these are great. this is fantastic! i do hope i win, it would make the perfect birthday gift. I just discovered your work via Feeling Stitchy, and I absolutely LOVE it! And that portrait of Nikola Tesla is possibly the greatest thing ever. I would love one of my little girl!!! New follower from Feeling Stitchy! obsessed.. these are so fabulous! That would be awesome! Love your work. What an amazing giveaway! Please count me in! What an amazing opportunity! I love your work! Please enter me in your amazing giveaway! Cheers. Oh Oh Oh!!! Me me me!! You’re work is awesome!!!!! Thanks for doing a giveaway, even if I don’t win! YES PLEASE!!!!! thank you for the chance! eeeeeep! Oh, yes. You’re work is awesome! Wow. This would be wonderful. When I saw your portrait of Tesla it reminded me of “Thunderstruck,” by Eric Larson. LOVE, LOVE, LOVE your work and would be proud to own one of your portraits. Cheers! I’ve just had to pop over from Feeling Stitchy for a chance to win this awesome prize. Good luck everyone. I love your Twin Peaks series – amazing! Thanks for the giveaway….what an amazing prize!! This is hands down the greatest giveaway I’ve ever seen offered. I feel faint. Amazing prize! Thanks for the chance!! I also friended you on facebook! Pretty much the best giveaway EVER! Whoa. This isn’t just another art/craft-ish blog giveaway. This is awesome. Please count me among the aspirants. What a gift! I’m over from Feeling Stitchy. Your work is amazing. Enter my name in your drawing please. What an amazing idea – yes please! I would love to win. And I am excited to peruse your blog…. What a FAB giveaway! I instantly thought of doing one of my nephew for a C-mas present for my sis-in-law! Would love to win!! I love your work! I would super love to win your contest. Oh wow, what an amazing honor it would be to be immortalized in stitches! Please count me in on the action! What a neat idea! I would probably have to have my oldest great granddaughter done. Thanks. wow! I can’t even imagine. Your work is so great. Thanks for the chance of getting my grubby hands on one of your art pieces. Would love to be entered! I like being part of interesting art projects. What a fantastic giveaway! I’d love a portrait! ooo, ooo! pick me, pick me! Youre work is awesome! Thank you for being so kind! Too cool! Hope I win! Honestly, I never enter blog giveaways, but I can’t resist this chance to win the BEST GIVEAWAY EVER! I would love to see myself in stitches! Thanks so much for the giveaway! You make beautiful pieces! Your work is fantastic! Please enter me in the contest. Fingers crossed! I’d love to win this! You are so talented! Want! Want! So very cool! i think you would have so much fun embroidering my huge beard. what a challenge it would be! hope it can be me. your work is amazing, by the way…. you have some amazingly mad skillz!! It’d be a honor to hang up one of your portraits! Oh oh, I hope I’m not too late. Amazing needlework you have there, miss. It’s really nice of you to do this. If I am chosen may I please wear my favorite cowboy hat? I really be happy if I win!!!!!!!!!!! Great prize, hope I win! This is an amazingly cool giveaway! I would love to win one of the twin peaks ones… are they also a part of it?? your work is so amazing. can’t believe i hadn’t seen it until now! Awesome! And hey, I saw your Tesla embroidery this weekend at the Tesla Project! this is really really cool prize ! WOWWWWWW! What an awesome giveaway, I would love an embroidered portait by you, your work is incredible! Ah! What an amazing opportunity! I’ve hosted a few custom embroidery giveaways on my blog, so I’m so excited to see someone else doing it. Thank you for the chance to enter! how very unique! I would love one of my daughter, you do such a great job 🙂 thanks for the chance to win and enjoy your week! I would love to win a portrait! Thank you! Wow, what a great giveaway! Your work is wonderful! These are wonderful! Whoever wins is very lucky! How generous! How wonderful! And what a brilliant idea. Thank you! Yay! What a great contest. My fingers are crossed! This is such a fantastic idea! I’m IN! Fingers and toes all very crossed!!! wow, this would be an amazing prize to win. you’re very talented. thanks for the offer/chance to win!! OH enter me! I’d like one. I’ll even send a portrait of myself in Groucho Marx glasses to make it interesting for you. SUPER awesome giveaway! Count me entered! So beautifully executed! Plus I just love that you’ve done Tesla – such a fascinating life. I’d love to win but if I dont you’ve inspired me to try this! oh YES! i love your work. cannot resist entering!! how generous and amazing this is of you! Wow, such a generous giveaway! Your style is so unique and there is something about the eyes of each portrait that keeps me staring back! What a great idea to do a giveaway whoever wins will have a real treasure. i love it, i want it…. Wow!! Amazing work and awesome giveaway!! I’m in!! Wow! What a giveaway! Sign me up.. I would love a portrait of one of the kids! I would love to have a portrait done, but I would rather be of my youngest son mikael. I love these portraits and your use of color. Please enter me in the portrait giveaway…I’ll keep my fingers crossed! Your work is amazing! True talent! Thank you for sharing your work with us. your portraits are really terrific! lynch would be so proud of these gems. this giveaway is a dream come true. How awesome! My fingers are crossed! Of course I would love to win a portrait from you! Who wouldn’t?? I want to win, but only if the portrait can be of me and my boyfriend depicted as a 2-headed dragon with a cameo of you in the bottom left hand corner attempting to slay us with a weapon of your choice. Surrounded by a wild inferno, of course. Loves to have my own potrait.. I absolutely would love a portrait of myself! Though if I should win, please note that I am on vacation without internet till the 24th. What a fabulous idea! Found your site via Mr X Stitch. off now to check it all out. Please enter me in your portrait draw. I’m looking forward to seeing more of your work on your blog! Brilliant. My husband would love these! Thank you for such an awesome giveaway. Crossing my fingers! I´m still on time? I´m always late!!! Of course I would like to have one of your portraits. Oooh! Me! Me me me! I would like a portrait! ENTERED THE CONTEST. These are super rad. Would you do a commissioned portrait? I do a lot of commissioned portraits. If you are interested you can email me or contact me through my artfire store.